This week the temperatures dropped here in Salt Lake. We actually had a Fall this year instead of the normal week between Summer and Winter so I’ve been feeling spoiled but I had to dig up the hats and scarves and gloves and they are spread all over the house. In a closet here, a box there, and a few more boxes in the dungeon. After a 15 minute dig fest as I tried to get out the door today only to give up on finding my favorite cozy hat I decided that it was finally time to put the winter accessories in a place that is easy to grab when you’re running out the door. It’s SO simple but I’m feeling kind of brilliant. 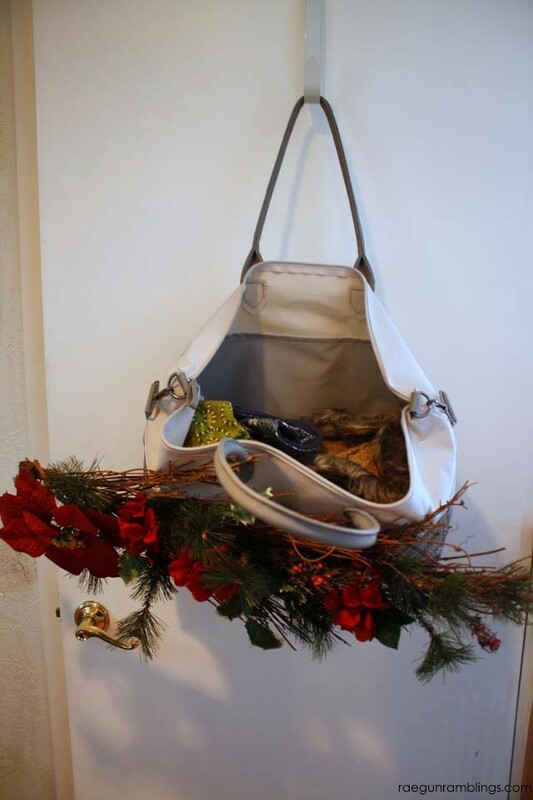 I took one of those big totes that they sell at Jo-Ann Fabric and Crafts stores (they are $9.99 when you spend at least $30 and you know I’m always spending more than that #fabricaddict) and I hung it on a wreath hook on the door right by my front door. 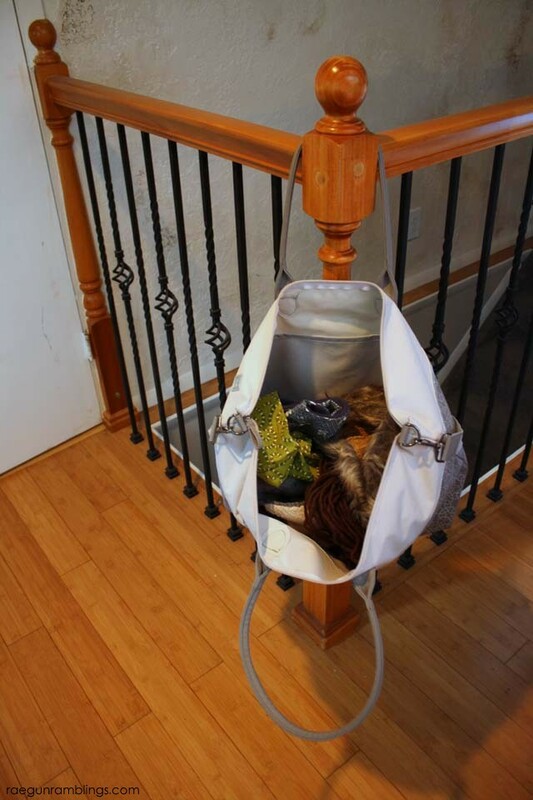 I also tried hanging it on my banister too I’m trying to decide where I like it better. After stuffing all my favorite 10 minute cowls that I made last year, a few of the scarves I wear with everything, and the rest of my winter accessories I thought I would get a little festive. 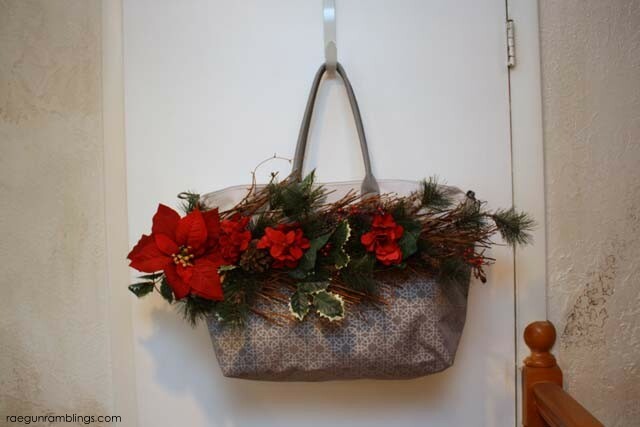 Don’t laugh but I totally safety pinned a simple Christmas swag (is that what they are called) to the outside of the bag. 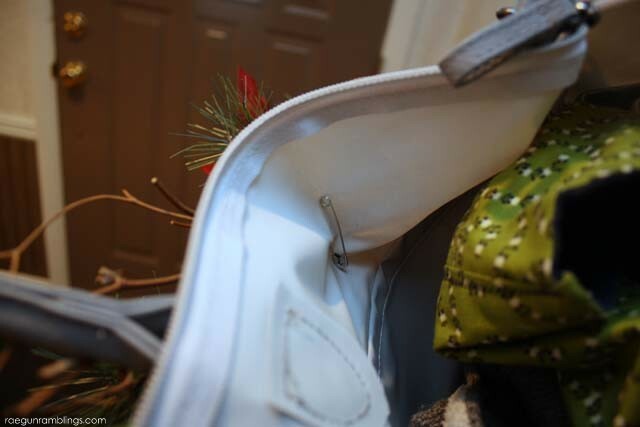 But I want to be able to still have the bag up after Christmas so safety pins were just right. Okay so it may be silly but I’ve been wanting something for this purpose forever and it works great so I figured that I’d share it with you. And the best part is when the weather warms up again all I have to do is zip it all up and stick it in storage. No more digging here and there. Thanks so much to Jo-Anns for sending me this awesome bag! So cute! I love that it provides a place for gloves that can be put away after it gets warm! This is such a great idea! I’m going to have to do it for my boys, so they can find the stuff they need to keep warm. I also love that you pinned on the swag, so you can use the bag later. Great thinking! 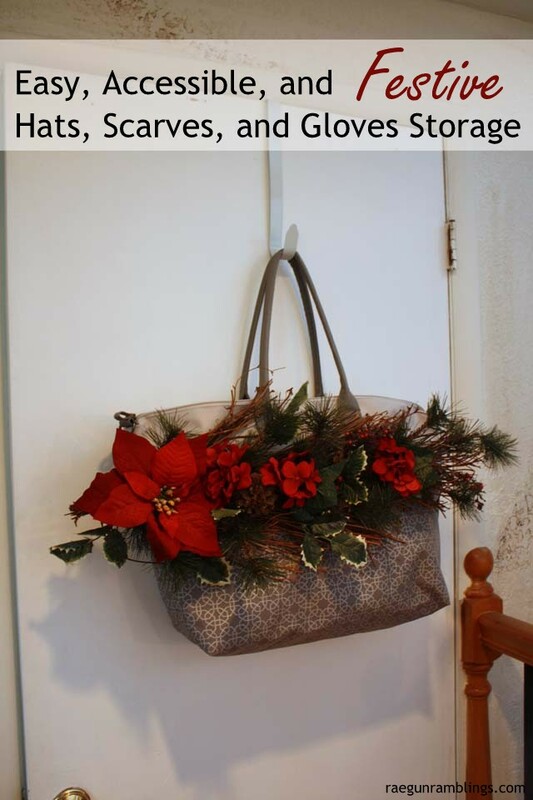 Oh I have seen these totes at JoAnn’s. I like seeing how you are using yours – great idea!